I posted this thread in January, and very uncharacteristically of me, I never posted my own answer to the OP. It was quite an undertaking, but here it is, so far. My RPG multiverse is a sub-multiverse of a larger multiverse. Universe of The Star Wars (TU) - The universe that the comic book adaptation of the The Star Wars rough draft screenplay takes place in. This universe is internally consistent and stable. A New Hope Universe (AU) - The universe where the only completely canon work is the original Star Wars film before Episode IV was added to the opening crawl. Aspects of the novelization plus other 70s adaptations and film information sources that do not contradict the film may also exist in this universe. Darth Vader is not Luke's father and Vader really killed Luke's unnamed father. And yes, Greedo never fired in this universe. Still to this day, when I watch this movie it is very easy for me to disregard the entire rest of the franchise and my own multiverse, and just return to my inner-1977 self when this magical movie was the only Star Wars we had and needed. I do enjoy the challenge of resolving apparent discontinuities between films and works of other media, but there is also something to be said about the simplistic joy of not needing to do that. This universe is delightfully consistent and stable! George Lucas' Universe or The Lucasverse (GU) - Lucas' own Star Wars universe based on the first six films (with Lucas' revisions), and Lucas' commentary about his personal SWU (which does contradict the EU and the CU). Although Lucas later devised the premise of TCW TV series and oversaw the production of the series, I do not include it in this universe because TCW was an afterthought that contradicts his film saga and effectively became the basis of Disney's Canon Universe (see below). Prequel detractors may disagree, but this universe is consistent and stable. The Expanded Universe or The Legendsverse (EU) - The films plus most published material since the '70s that Disney now puts a 'Legends' label on, plus the FFG RPG (so the universe is still expanding, albeit much more slowly now). TCW does not have the Legends label and was never a part of the EU. The EU was internally inconsistent since its very conception by trying to shoehorn Dark Empire into the same universe as The Thrawn Trilogy. Now after over 20 years, the EU is extremely unstable, on the verge of exploding. The Canon Universe or The Disneyverse (CU) - The films plus TCW, Rebels, and all the new canon works published by Disney without the Legends label. Like the EU, this universe was born internally inconsistent and Disney is repeating many of the same mistakes of the EU. It's unstable, and quickly growing. The Whills Multiverse (WM) - My sub-multiverse of RPG "campaign universes". S6 or WU (The Whills Universe) - My current world. When I say "my Star Wars universe" (or "my SWU"), this is usually what I am referring to. In the Fall of 1988, I was running two Star Wars campaigns ("S1" and "S2") simultaneously, but my original intention was that both campaigns existed in that same reality, which would allow for adventures with player characters of both groups. This didn't happen as planned partially due to game balance concerns: The S1 PCs were always more advanced than the S2 PCs because the second group started adventuring months after the first one. I also realized that it would be much easier to run some of the same original and published adventures for both player groups, so the concept of the Star Wars Multiverse was introduced in early 1989 with the declaration that the S2 campaign took place in an alternate reality of the S1 campaign. The game worlds were given out-of-universe designations based on the name of the campaigns that took place there. The Star Wars Multiverse concept, admittedly inspired by the Pre-Crisis DC Multiverse, also allowed for alternate versions of PCs of each universe to appear in others as NPCs (and in a couple rare cases as PCs). Heroes of one world could sometimes even be bad guys in others. The adventures of my homebrewed Star Wars RPG I had created back in 1983 were eventually canonized into my Multiverse by being set in a universe named S0. At the heart of all my Multiverse is A New Hope, the only film canon which definitely took place in every universe. The first Star Wars RPG full-length published adventure module, Tatooine Manhunt, was the only adventure to be played in S0, S1, S2, S3, S4 and S5 (of course with different PCs and some other plot changes from world to world). In tribute to the first Star Wars adventure I created in 1983, all of the campaign worlds have a location named "Star City", but that place has not always existed in the same star system. All of the campaign worlds portrayed adventures from about 3 BBY to 17 ABY, although some of them did diverge from sequel continuity. The nine universes are detailed below in the order of their first real-world appearance. There were two S1 adventures involving PCs traversing universes. (See S1, S0a and S1a). AKA: setting of Stars & Wars / setting of Star Wars: The RPG non-campaign-continuity adventures / "The S0 Universe"
*	The same weekend we had started the S1 campaign in 1988, I also ran the first of a few adventures (taking place after A New Hope) for one of my S1 players. Over that summer, Jeff P played a couple of Rebel characters who flew from one mission to the next in a two-seat Y-Wing Fighter. Before he became a player in the S2 campaign (see S2 below), Chris B played a pair of bumbling smugglers trying to get into the Alliance in the Fall of '88. *	For three adventures played in 1989 which were also set in the time of the classic era, I was a player and not the gamemaster. Chris B was GM for one, and Jim C ran two. I played a human Brash Pilot in Chris B's adventure, but I'm not sure who else played with me (probably Jim). For Jim's game I played a human shipjacker-turned-Rebel, leading two different groups of PCs played by Chris B, Jenny and others (I can't remember who, but they were likely some of the S1 and/or other S2 players). Jim's game revealed that the Tatooine of this universe had a secret Imperial military installation far out in the desert, purpose unknown. *	The Adventures of Squad: Zero was my third WEG Star Wars campaign, ran concurrently with the first two Winter/Spring 1989. In this series of classic era adventures, Sean usually played a Force-sensitive human Test Pilot leading a group of various Rebels played by Kevin F, Hassan, Dave, Thad, Jim C and others I can no longer recall. This episodic campaign formed the bulk of the stories taking place in this universe. One of the players christened the Rebel team 'Squad: Zero' to give the campaign universe's designation (S0) an in-universe meaning. *	The S&W adventures from 1983 were set immediately after RotJ and thus took place in the future of the above adventures. The first S&W adventure had involved a journey of Mike S, Jason, Ryan's PCs across the deserts of Tatooine to the Star City Spaceport. The main antagonist only glimpsed and never named was a mysterious green-skinned D&D-half-elf-looking man in black cloak. We only played a handful of adventures for this homebrew game, some ran by myself and others by Jason. "Star Wars Campaign Universe 1" was the setting for S1 (Star Wars Campaign 1), my first WEG Star Wars campaign. By Spring 1988 I had recruited three players: Brian, Dan, and Jeff P. I didn't feel that only three starting PCs would have the necessary skills set for the various aspects of our adventures, so I asked my players to create two characters each from the templates I allowed them to choose from (two templates were augmented). After the four of us created six PCs in May of '88, we decided we would begin the first adventure of our campaign on the last day of school. Brian unexpectedly showed up with his little brother Michael and asked if he could also play, so I picked a template for him and we quickly created his character right before the first game session. For the first twelve adventures, the leader of the 7-man squad was Captain Colton, while Kazan, Rip, and Rexas all served as impromptu seconds-in-command depending on the mission. The adventure after Jon was introduced was the only one that started with an 8-man Black Squad because at its climax, Rip was killed as a result of the group's involvement with underworld entanglements. Kazan had been tutoring Jon in the ways of the Force, and at the beginning of the next mission (for which Lars, Kazan and Rexas were all absent), Jon was made the official co-foreman of the squad. Two adventures after that, Kazan was killed. Both Lars and Rexas were then transferred to other branches of the Alliance (in reality so all four players only had to play one character). Jon inherited Kazan's lightsaber and was promoted to lead the remnants of the team, while Biggs was Jon's second-in-command. This more experienced 4-man incarnation of Black Squad continued to serve the Alliance for many missions. S1's Black Squad are the only PCs in my Multiverse to have multiversal adventures. In the campaign's penultimate adventure, Jon, Collen and Vendetta were inadvertently transported to the S0 universe and unknowingly created a divergent universe, S0a (see below). The PCs eventually returned to their own universe. In the final adventure of the campaign starting out over a year before TESB would have taken place, those three PCs were reunited with their teammate Biggs before advancing the S1 timeline 15 years forward when they were instantaneously blasted into a dark future they believed they could prevent by going back to their own time. The Alliance had lost the Battle of Endor, the movie heroes were all dead, Palpatine still ruled the galaxy with Vader and three Death Star II-class Death Stars, and the Alliance's only remaining Force-user was a teenaged son of the deceased Black Squad teammate Kazan. Jon chose to stay with the future Alliance in case the others just destroyed themselves trying to go back, and the last documented events of the S1 universe were Black Squad severely crippling one of the Death Stars right before the other three PCs entered a time warp. Biggs, Collen and Vendetta did make it back, but reappearing in a past they had originally been absent from unknowingly created a divergent reality, S1a (although the PCs believed that they had just altered the timeline so that the S1 future they had visited would be overwritten). See S1a below for the continuing adventures of the three S1 heroes. This world's Alliance had no Black Squad, but S2-counterparts of some of the S1 PCs were known to exist as NPCs who had never joined the Alliance. S2 instead featured the adventures of the rebel Green Squad (as in the Star Wars Campaign Pack). The first five PCs above became the second incarnation of Green Squad after the deaths of all but one of the first team's members (NPCs), inheriting the use of their ship, the Long Shot, and two droids. Axel was appointed the leader of this new group with Max as his second in command. After the new team's second adventure, this campaign universe diverged from sequel film continuity when Axel and Max went on a mission in which they traced top secret Imperial military supply shipments to the Forest Moon of Endor, befriending some Ewoks and discovering the construction site for a major top secret project about a year after the Battle of Yavin. The second Green Squad served together for many more missions until their final adventure as a team in which Max valiantly sacrificed his life to save the rest of the squad. Suffering from the loss of their comrade, Styles and Orion then went on a mission in which Orion crossed over to the Dark Side and disappeared. When Styles returned to his Rebel base alone, an even deeper depression set in when he discovered that Axel and Mortimer had been transferred away. Then Styles was promoted, given command of the Long Shot (and its droids), and asked to form a third Green Squad which he would lead. Styles enlisted the aid of Siene Symm (NPC), the only survivor of the first Green Squad, to be his co-pilot. On the new Green Squad's first mission, Styles recruited his high-school-physical-education-teacher-turned-bounty-hunter, Zach Flannagen (Jim C), into the Rebellion. After two missions with Styles, "Flann" left Green Squad and became a solo agent, starring in at least two adventures on his own. Styles continued to lead the third Green Squad, having many adventures with a few additions to his motley crew (all low-level GCs). A good chunk of the metaplot of this second S2 campaign mirrored the S1a campaign (below). In this Green Squad's final adventure, Siene Symm and the rest of the crew of the Long Shot sacrificed their lives to save Commander Silverman and the ship. Styles was then reassigned to starfighter squadron. The Long Shot was given to Axel and Mortimer and renamed The Hot Shot. In their next mission they recruited the starship thief Tojan Kamitsu for the Rebellion. The trio formed the basis of "Red Squad". In the final epic adventure of this third S2 campaign, Red Squad was joined by Styles and they ended up killing Jabba the Hutt and Boba Fett, and stealing Slave-1. Afterwards, the chronicled adventures of this campaign world came to a close when Flan, Styles and Axel were summoned to the Rebel Fleet to be a part of an Alliance strike team that would attempt to knock out the Imperial shield generator that Axel had discovered in the Endor system a year prior, now protecting a new Death Star under construction. In S1's 1989 penultimate adventure inspired by the Star Trek TOS episode "Mirror, Mirror", the Rebel Fleet had been executing repairs near a space-time anomaly that hid their presence from an Imperial fleet that had been hunting them a little over a year and a half after ANH. Black Squad (minus Biggs) was returning to the fleet from reconnaissance missions in nearby systems when the anomaly suddenly changed in size and shape without warning. The S1 heroes flew into the anomaly at the same exact time as counterparts of theirs from an alternate universe were flying into their corresponding anomaly, which triggered a temporary connection between the two universes that caused the minds of the three heroes to transfer to the bodies of their cross-universal counterparts. The universe they found themselves in was very different: The counterparts of two Black Squad members who had died in the S1 universe were still alive in this alternate universe, and all eight of the Black Squad counterparts had never even joined the Alliance. Three of the eight counterparts were Imperials, one was a ruthless bloodthirsty pirate captain, and the other four were independents just trying to make their way. The PCs ended up killing the evil counterpart of their fallen comrade Kazan and returning to their own bodies in their own universe, where they discovered that their counterparts' minds had inhabited their bodies in their absence (but presumably also returned to their own bodies/universe). This adventure had developed out of an actual S1/S2 multiversal crossover adventure that would involve players from both campaigns, but that never exactly materialized. When reworking it as the second-to-last S1 adventure, I didn't like S2 being the other universe because some of the S2-counterparts of the S1 PCs were already dead by that point (killed by the S2 PCs). So in the final adventure as designed, the Mirror Universe was instead intended on being the S0 universe. In play, the adventure went a lot differently than planned after one player had cancelled at the last minute so his S1 PC had to be written out of the adventure (and thus replaced by his evil NPC counterpart). The S0 universe had a timeline of events that went in the future of this adventure, and the adventure irrevocably altered the course of those events, so the S1 PCs traversing to S0 ended up created a divergent timeline/reality I call S0a. The narrative of this new timeline continued as a setting for an entire campaign which tell the bulk of the stories set in this universe, the base player group being the players of the S0 campaign, with players from S1 an S2 as well. The S0a campaign played the Summer of '89 was simply called "Hunters' and featured the adventures of a bounty hunter guild (Hunters, Inc.) that evolved into an elite mercenary company. Their field commander was Hairblat the Wookiee Bounty Hunter (played by Sean), and his brother was Habaccabacca the Galactic Wrestling Federation Champion (played by Matt C). Jeff P played Rip Khengas, a human bounty hunter in black stealth armor based on his deceased S1 PC. (This universe's version had been an NPC in the S1 "Mirror, Mirror" adventure.) Brian played a human hunter in Mandalorian armor. Kevin F played a con man (the faceman of the group), and Dave played a former shock-ball athlete. Someone played a Gamorrean, maybe Chris B. In one epic all-nighter session with 13 players, the Hunters captured a Victory-class star destroyer (with minor damage and missing all lifepods, and at least 1 PC had died). A more entertaining adventure was the attempt to auction the VSD off to the highest bidder. Over the course of the campaign, the PCs destroyed the Millennium Falcon, killing Chewbacca and making an enemy out of Han Solo who left the Rebellion to seek vengeance (S0a clearly diverged from film canon before TESB would take place). The Hunters acquired so many enemies that they became the hunted, and about half of the large pool of PCs died in the campaign (Solo was an ongoing protagonist who had himself killed a couple of the PCs). The Hunters killed Jabba the Hutt and Boba Fett, then gave Slave-1 to Solo. They negotiated a conditional peace with Solo so they could make a contract with the Alliance for the ultimate bounty: Emperor Palpatine on Imperial Center. At the end of the campaign, Luke Skywalker had completed his uninterrupted Jedi training on Dagobah before turning to the Dark Side, killing Vader and going into hiding. Palpatine's spirit was trapped in the body of the non-Force-sensitive Gamorrean PC in the hands of the Alliance. Solo ended his vendetta on the Hunters, joined the Alliance and left with Threepio to track Luke down. Princess Leia and Artoo left to find Yoda. Hairblat and one other Hunter were extremely rich galactic heroes. In 1995, S0a was the setting of its final chronicled adventure in which Mike S reprised his 1983 S&W character in WEG Star Wars 2nd Edition form, playing in an adventure similar to the first adventure of the S&W game we had played 12 years prior, which had been set in the universe this reality diverged from. Also set on Tatooine, this adventure portrayed Gremeckoran the Wookiee smuggler getting involved in the power struggle in the vacuum left by the death of Jabba the Hutt and the rebellion against Imperial authority. In a S1-S2 cross-over adventure of sorts, Zun Tzu was joined by S1a-counterparts of two S2 PCs played by their S2 players: Axel Hitler and Tojan Kamitsu assisted Zun in a mission for the Alliance on a jungle planet. Sometime after that, I ran a couple battle scenarios between two players, originally intended to be 'just for fun' but I canonized the results. Zun (Jeff) had come into conflict with the S1a-counterpart of the S2 PC Styles Silverman (Chris B), who turned out to be a villain in this reality. Zun flying a B-Wing fighter engaged Styles flying a stolen X-Wing fighter. Styles won that round by destroying the B-Wing, but Zun had ejected and survived. Later, Zun hunted Styles down and they engaged in one-on-one personal combat. Armed with his lightsaber, Zun brutally killed Styles out of revenge, beginning his descent towards the Dark Side. Zun (Jeff P) was joined by Collen (Brian) for a mission. And the three S1 Black Squad PCs teamed-up one last time for an adventure in which S2 players played the S1 characters: Zun (Jim C), Collen (Chris B) and Vendetta (Kevin B) successfully infiltrated an Imperial star destroyer and took control of the bridge. This adventure was played just for fun, but since there was no negative outcome for Zun and nothing happened that contradicted the continuity of the S1a campaign universe, this adventure was canonized. After many successful missions for the Alliance following the disbanding of Black Squad, Zun Tzu maimed a completely subdued Imperial engineer out of rage and revenge, which was the moment Zun completely crossed over to the Dark Side. This tragedy was the final chronicled event of S1a. This group played seven full-length published modules, plus many other adventures. Despite this Black Squad's many successful missions for the Alliance, S3 ended with an even greater tragedy then the S1a Biggs/Zun narrative. In the final adventure, the PCs and their commanding officer were killed one by one, until only Gunther remained, suddenly confronted by Darth Vader in a dark alley (fade to black). I think I was too influenced by the Cthulhu campaign all of the players and I were playing in concurrently. AKA: "The 2e Universe" / "The Teke Universe"
* The background of Ted's first character stated that after he had realized his Force sensitivity, he started to hear a voice inside his head, but didn't know whose voice it was and just assumed that it was the will of the Force guiding him. Matt hadn't made a PC, but just showed up one game session to watch, and eventually started giving suggestions to Ted as if he were the ghost of Obi-Wan Kenobi. Since it was in the spirit of Star Wars and everyone found it entertaining at the time, I allowed this to continue. The episodic campaign name, The Adventures of Silver Squad, had multiple meanings. Silver is part of the color scheme of the 2e core book cover, and it is one of my fraternity's colors. (I think there was also a PC or NPC counterpart to S2's Styles Silverman). This world was known to have NPC counterparts to PCs from S0a, S1, S2 snd S3. Over the course of the campaign, the PC who starred in the greatest number of adventures was Kar, Kurt's Mon Cal Pilot. The first half of the campaign took place during the classic trilogy, but the later adventures played after I graduated from college took place after RotJ. While S4 was the setting for only one campaign over the course of several years, S5 was the setting of many various campaigns and adventures played over the course of a 20 year period. NPC counterparts of PCs from all my previous campaign worlds exist in this world. An adequate summary will have to be a future post! AKA: "My Star Wars Universe"
You are channelling the spirit of Tolkein here. My hat's off to your meticulous archive. My notes of previous campaigns are fairly spotty. Hand-written from the early days, some of which I still have. None of my campaigns have had much of an opportunity to overlap, so I've never had to cross the bridge of deciding definitively. I had a mix of players without any overall goal; typical 'D&D style adventuring group.' Basically murder hobos...IN SPACE!!! This game centered around a friend who I had run a solo D&D campaign for, where he had 'accidentally' stolen a sailing ship and was on the run and forced to turn to piracy. It was pretty fun, until he got posted to the other side of the country for a few years. When was finally back in my area of the world we decided to strike up a Star Wars game. I basically took the premise of the D&D campaign and Star-warsified it. His character was now in charge of an 'accidentally stolen' corvette. We had a few other players fill out other members of the crew. This was a Star Wars game I ran for two friends. The premise was a Star Wars version of the movie Road House. They were a pair of bouncers that drifted from cantina to cantina hiring themselves out as security and cleaning the place up of the nastier elements...and getting into local adventures along the way. They eventually bought their own ship...but the campaign ended when they went to work for Jabba...and Jabba ended up selling them into slavery as gladiators. They lasted a fair while, but eventually died fighting. This was a campaign for a group, centered around a tramp freighter and his group of passengers that was the other players. They got caught up in the young jedi wannabe's hunt for lost jedi secrets. The adventures were fairly typical as they went planet to planet in their search, running afoul of the agents of the Empire looking for the young force-seeker. The first game where I had specific restrictions for the players upon character creation owing to the theme I had. Basically I wanted to run a game loosely based on the first Fast and the Furious movie, but with swoop bikers. I had a custom list of about 15 character archetypes I'd like to see and my 6 players chose from them. It was a long running campaign that eventually saw them acting as local resistance to the Empire, like The Wolverines of Red Dawn and ended with them getting recruited a fast scout unit for the Rebel Alliance. Note: This one had it established that the Death Star was NOT destroyed by the rebels and instead blew up Yavin IV including, presumably Princess Leia, though details about Luke and Han were not known. The players just heard about it as an aside...it didn't concern them directly at the time...but it was what started their guerilla war against authority on Tatooine. This one I set during the Clone Wars, and I started it when only the animated shorts existed, not the CGI TV show. I had each of the 6 players generate a youngling and I had a pre-system to track their development at the jedi temple from the time they were toddlers, with the players making choices along the way, right up until they get selected to be padawan learners. They started grouped together because all of their masters were killed at the battle of Geonosis, which began the campaign. As player characters were killed, they were allowed to create senior clone trooper characters, or other supporting characters. The last 2 remaining padawans made it to the Jedi Trials and became Jedi Generals. I used a mass-land combat system to game through ground and space battles. The goal was to play right up to Order 66 where all of a sudden I'd decree that the players with Clone characters would have the initiative and attempt to assassinate the jedis...and see where the chips fall. But we never made it that far due to my having to relocate for my job. This is my current game, with all of the players having mandalorian characters working as a clan for personal wealth and glory. Heavily influenced by Sons of Anarchy. 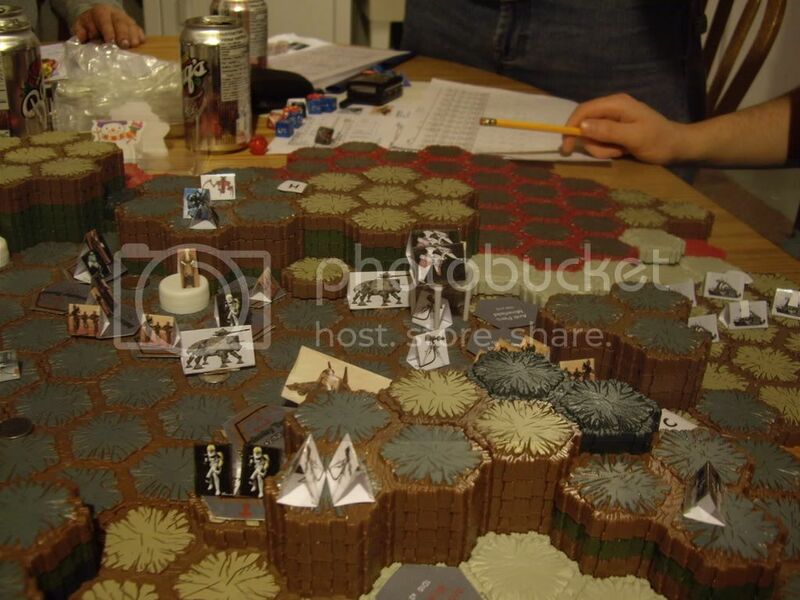 Photo from a Clone Wars battlefield. Notice the Jedi character standing on the white bottle cap near the center -left. He's one of the PCs. The bottle cap represents a shield generator he is guarding. I don't have enough continuity of play to make a multiverse. The closest I get is having running Pirates of Prexiar multiple times for different groups, with different goals. Yes we had two main GMs who shared duties. I ran maybe 60% of the sessions and my co-GM ran maybe 40% of the sessions with me doing most of the universe/sector/world creation and maintenance. We also had one player run a single adventure. I think it was Planet in the Mist. So far I've done this. Let me see if I can list the various adventurer groups. 1. Mouse and Montoya are a pair of smugglers. Alamé Montoya is a female Han Solo kind of smuggler, except her heart is copper, not gold. She never does good deeds for free. Mouse (alias Nien Mutik) is her partner and first mate on the Argo. He's a Sullustan who for reasons can't speak basic and only makes mee-mee-mee sounds which his partner of course understands. This tends to play out like dialog between Han and Chewiee. The two players often successfully pull off the one player saying mee-mee-mee and the second player figuring out, from context, what the heck that means in this situation. At one point they were tossed in jail where they helped break out some other PCs, Tora and Janassar. 2. Tora Jesek and Janassar Rae were a team acting as bounty hunters. Janassar was a bounty hunter, Tora was a failed Jedi. They started out with Janassar hunting Tora and then figuring out the crimes she was accused off were all part of a set up. They teamed up for a while until Janassar's player moved away. Originally the player used a picture of Tanda Pryl the captain of an Imperial Star Destroyer assigned to the Elrood Sector. (The picture is in the Planet’s Collection.) As a result I decided that Tanda Pryl was actually Tora’s identical cousin and eventually a nemesis. Tora also had an ex-boyfriend and fellow Jedi student who became Inquisitor Tremayne. 3. Tora and Bren. Bren Fairchilde was my character. He was a Luke Skywalker-like young Jedi brash pilot who was orphaned and raised by his non-human foster aunt and uncle. Tora was Bren’s teacher in the ways of the Force. After a time Bren went off to adventure without her and teamed up with a Coynite exile, Arkel Tevar Triss (that's the short version of his name). Bren and Arkel became blood brothers. In parallel with Bren’s activities Tora ran on some solo adventures. 4. Tora alone. Solo adventures mostly with NPCs, but occasionally intersecting with other PCs for an adventure or two. 5. Bren and Arkel. These guys ran together and occasionally bumped into characters from the other groups. They joined the Rebel Alliance. The local group based in Elrood Sector and a neighboring sector was known as the Union of Free Planets. It included Rebel groups from five different planets. 6. The CARP group. This was an open table group of players. They started out as prisoners on a slave ship. This group ran for only a few months before it fissured. Deklin Star Rider a freighter pilot, human male an orphan. Mandok was his sort of“brother” as they grew up in the same orphanage. Maris Devant female human slicer with a dark past. Mandok the Cleaner was a human male who grew up in the same orphanage as Deklin. Gorre a Trandoshan bounty hunter. Dirk Westone was a human male and a Rebel cell leader in the Friends of Paran. Grawg Nach the Wookiee was a bounty hunter who tolerated Gorre for some reason, and vice versa. 7. Maris and Deklin. After the CARP group dissolved. Maris and Deklin ran as a duo with some romantic tension. Maris eventually redeemed herself but died a heroic death saving Deklin and others. 8. Desperate Chance. This was a short lived group of PCs on a freighter named the Desperate Chance in the Minos Cluster. Brice Rexius human male, brash pilot and captain of the freighter Desperate Chance. Lucus was a human male, young Jedi. Mikki Westfall was a young human female and the ship’s engineer. We lost some of the players and that group soon fizzled. They never interacted with any other PCs from other groups or went anywhere those PCs went. So they could be in a separate universe. The universe would only matter if I ever wanted to run a Minos Cluster campaign a second time. 9. Miscellaneous PCs without separate sagas. These weren’t part of their own group but ran with or into other PCs for one or two adventures. DocCarson was a near sighted tech who left to adventure with Tora and Janessar. He became an NPC once his player moved away. Tragically he was captured by a cult of assassins on Merisee, turned into an NPC, tortured, and traumatized. With the help of skilled counselors on Merisee and some kind and inspiring words from Bren Fairchilde, Blinky's pysche was put back together so he could join the Rebels of the Union. Rijel Zillah was a brash smuggler. His player couldn’t play very often so he was mostly an insert into various other adventures. He also played a bit of a mentor/older brother role for Bren. Rork Tolliver a loyal royal guard from the Planet Lazeria. He was first run in the adventure Planets of the Mist, then because part of an adventure or two for Tora. Tox Utat was a human bounty hunter in heavy armor. Edelrod Spangle was a minstrel who was interested in learning tales of the Jedi. He briefly teamed up with Tora Jesek, but the PC didn’t really work well and he was left to fade into obscurity. Paloma D’ukal a Mistryl Shadow Guard. As a PC she was designed to interact with some very experienced, established PCs and so she was created with more than the usual starting skill dice. 10. Miscellaneous Union PCs. The Union of Free Planets was an alliance of local Rebel groups consisting of groups from 4 planets in the Elrood sector: (1) Derilyn—the remnants of the Derilyn Space Navy (DSN) as well as the Friends of Paran a local planetary Rebel group; (2) Kidron—the Kidron Defense Force (KDF); (3) Merisee—the Cult of Those Who Redeem (the Redeemers); (4) Elrood (the planet and sector capital)—forces include the Elrood Liberation Front (ELF is a group of anarchist slicers and commtechs), Radell Mining (a major sector corporation swayed to the cause), and a small group of urban terrorists from lower-class Elrooden Urban Monads or UrbMons; and (5) Carillon in neighboring Thuris Sector—the Free Army of Carillon (FAC) consisting of defectors from Carillon’s local planetary defense force. Union Forces gave rise to a lot of NPCs as well as a number of PCs that only saw play on a few adventures each or guest PCs for a single session. Often these PCs were played while teamed up with some of the major PCs. Deklin and An s’Laq. After Maris Devant died Deklin joined the rebel forces of the Union and was teamed up with a brash gunner, a female Teltior from the planet Merisee in the Elrood Sector. Commander Logan who looked like Michael Ironsides and kind of acted like him in his role as Jester in the movie Top Gun. He was in overall charge of starfighter command for the Union forces. Logan generally interacted with Bren and Arkel. Raviel “Raven” St. John was a human female, starfighter wing commander and eventually second in command of the Union’s starfighter forces. Raven generally interacted with Bren and Arkel. Voren Na'al was a historian. His appeared in the Rebel Sourcebook along with stats and a picture. We added him in as a Rebel observer sent by the Rebel High Command to liason with the semi-independent forces of the Union. Major Ander Connal was a brash military man who believed there was no such thing as too much firepower. Akeo Danyr was a young human female wannabe engineer who ended up as a Rebel Commando. Avril Corlos a female human brash pilot from a jungle world and Ashley Riot a male human ex-Imperial pilot. Chaim Martel male human, ship captain. Grukla a female Gamorrean with a dyed purple Mohawk, assault trooper. Angela female human SpecForce Infiltrator. Jaska a female human street kid who pretends to be a boy. The Light of Freedom. This included several PCs in the ship’s crew. Commander Harmony “Harm” M’Klane was the captain of a Rebel Alliance corvette, the Light of Freedom. Blare Estrella was the ship’s medic. A human male from Derilyn he studied medicine in the city of Paran before it was destroyed by an Imperial orbital bombardment. As’Rais was the weapons officer and a Coynite male in search of revenge against the Empire. JoMo Qwix was a Gungan male originally from Naboo; he was an ordinary crewman and semi-comic relief. Hek Nkik was a Jawa Engineer and scrounger. 11. Green Squad the Fakir Sector Campaign This is my current active campaign. It has 3 players and 3 PCs: Bentlix Risk a human male Gambler and Squad Leader, Cassanna Hewelac a human female Young Jedi, Graffa of Wōd a Shaull female Curious Explorer. None of these characters have armor. And they all have STR below 3D (2D+2, 2D, 2D respectively). Which I have to admit is kind of unusual. We've also even had at least one thread where we discussed time travel adventures in this game. I ran something that was sort of both of these things. Not exactly a time travel adventure, but an adventure set in a possible future for two of the Star Wars characters as well as a crossover with characters from our Star Trek campaign. For the Star Wars PCs this was set around the time of the Empire Strikes Back which was roughly 3 years ahead of where we were in the main Star Wars campaign time line. This was a crossover scenario with our Star Trek campaign, named Crossover. (Catchy title, no?) The adventure came about as the result of a rip in the space-time continuum and it assumed more mature, experienced versions of the Bren and Arkel, the Star Wars PCs (since they were a few years in their future). It also required conversions between the FASA Trek system and the D6 system for both sets of characters. I believe I used the FASA rules when the characters were in the Star Trek universe and D6 rules when the characters were in the Star Wars universe. Note that I assumed that the two universes are either disjoint or parallel universes of some kind. So it seems like all of your campaigns could possibly take place in the same universe, since that Minos campaign fizzled and the characters never did anything to contradict previous campaigns? Here I was thinking of characters going from one Star Wars universe to another Star Wars universe, and you totally went beyond my imagination! That crossover is cool! Not worrying about continuity between campaigns so some could possibly take place in the same universe but your multiverse is never conclusively determined is of course perfectly acceptable. I just find it fun to organize campaigns and adventures into a multiverse of campaign worlds, but that's me. It would seem that even with the multiple Pirates of Prexiar campaigns having different goals, they would still have to take place in separate universes, so at least that could be determined. Not that you ever cared to. So far at least. The in universe start date of the current campaign is undecided. So far nothing has occurred that interacts with or contradicts anything involving past PCs or NPCs. It worked surprisingly well. Most of that was due to players who were good about getting into the spirit of things. I also think it helped that I was at pains to ensure that characters from neither universe were overly advantaged or disadvantaged and were able to do things in keeping with their personalities and past behaviors. Because the Star Wars PCs were heavily outnumbered by Star Trek PCs (a couple of X-wings showed up near some much larger Star Trek ships) I intentionally set the PCs from the Star Wars ahead in their time line so that they would be more skilled and thus better able to hold their own. In addition since our Star Trek campaign was set in a time where the Federation was mostly at peace (somewhere between TOS and TNG) I wanted to highlight the contrast in attitude between characters who were heroes of the Rebellion and thus had been part of a galaxy at war for years and the more peaceful, less militaristic attitude of the Star Fleet characters. The came out in the initial encounter where one set of characters routinely set their phasers on stun while the others had blasters on a lethal setting and used a sword or lightsaber that could bisect a person in one blow. Having played and GMed both settings and having run a crossover adventure also gave me a different perspective on the internet sturm und drang of the Trek vs. Wars arguments. And with the technology, much like with the characters, I was at pains to ensure that the respective technologies of the two settings retained some reasonable advantages and disadvantages e.g. Star Wars hyperdrive can be (depending on the plot/route) almost unimaginably faster than warp drive, but Star Trek ships can fire weapons while in warp while Star Trek sensors can be (depending on the plot/environmental interference) much longer ranged and more detailed in what they can scan than are the sensors in Star Wars and until we see the gunboat runabouts in Deep Space Nine or Voyager (which take place decades after the time of our Star Trek campaign) Star Trek has nothing to compare with the combat effectiveness of Star Wars starfighers. I forgot to include my active campaign. For that I'm using the Long Shot campaign outline from the Classic Adventures supplement. Green Squad the Fakir Sector Campaign My current active campaign. Bentlix Risk a human male Gambler and Squad Leader, Cassanna Hewelac a human female Young Jedi, Graffa of Wōd a Shaull female Curious Explorer. None of these characters have armor. And they all have STR below 3D (2D+2, 2D, 2D respectively). Which I have to admit is kind of unusual. Since this is a completely new sector in an entirely different region of the galaxy and, so far at least, the time line is undeclared as to whether it is a bit before or just after A New Hope. There aren't any character driven continuity challenges. However the map is another thing. Nowadays there are some very nice galactic maps identifying sectors and the locations of individual star systems. This even appears to be canonical information. Back in the day, that level of detail and consistency were lacking. We created new planets and I positioned the sectors and planets from the WEG materials where I wanted (subject to my ability to discern any logical relationships). So locations would be an issue. If that is, anyone knew what the old locations were or cared if they differed from the new locations. My co-GM isn't part of this group so only I would know. And for the most part, only I would care anyway. So I'm leaving the issue of is this new campaign a different universe in a multiverse undecided for now. In response to the original post, our group has always played in a UNIverse, that maintains continuity from one campaign to the next. When the first set of heroes has saved the galaxy enough times, they pass the torch to the next group of PCs (so to speak). We have had prior PCs return for cameos in newer campaigns wherein the original player assumed both the current character and the old PC. Was fun to bring out some of the "old tricks" from time to time. After moving away from my last gaming group, I carried on with my last PC in leisurely writings picking up where the campaign left off, and have brought in characters from other campaigns and a different gaming group into the new story without regard for continuity (they are essentially being recycled into a new continuity, with back story being modified if necessary to fit). That is the closest I have ever come to a multiverse. So the characters brought in from different gaming groups are technically, in your universe, new versions of characters from another universe. So even in your writings you have only had one SW universe, right? I would not at all say having a multiverse is the goal. I only even started a multiverse in high school because I was running multiple campaigns for multiple gaming groups of players simultaneously. For a while I had three gaming groups at one time, and I would occasionally run for two of them in one weekend (I obviously didn't have a girlfriend for most of that time, lol.) It was just so much easier for me to reuse adventures (originally mostly my original adventures) and NPCs in each campaign, which would mean the campaigns could not take place in the same universe. As far as I knew, the players who played an adventure first didn't spoil it for other groups, despite the fact that we all went to the same high school and had friends in common. Even then a "multiverse" concept wouldn't really be absolutely necessary until the multiverse appeared within adventure continuity. I had one adventure in my first WEG campaign where PCs went to another dimension of existence with a single flatland world, and then my second WEG campaign later had a similar adventure but I thought it would be more fun if the PCs learned about the previous adventure (and this adventure was a sequel so-to-speak), which means two separate campaign universes had access to this one dimension and thus a multiverse continuity then existed (but this other dimension was not part of the multiverse). Then PCs in my first WEG campaign had an adventure where they actually travelled to another universe (the world of my first pre-WEG homebrew Star Wars game), and ended up altering future continuity in that world thus creating a diverged universe. And then in the my first WEG campaign's final adventure, the PCs were blasted into a dark future and three of the four travelled back to their own time, preventing that future and thus creating another divergent universe. In my Blue Vader 2e days which started in college, even though there were a more published adventures and campaign materials by then, I had all new players who had never played the game and I thought some of the 1e adventure modules were classics, so I wanted to reuse the adventures (and their NPCs). I also wanted to stop contradicting film continuity, so I set this set the campaign in a new, seventh universe that lasted for 4 years. I only created one original adventure during this time, but it was a one-shot set in one of my older universes (and then that universe was also retired). After R&E and the Special Editions came out, I had all new players again (with various prior experiences with the game) and wanted to reuse adventures again, so I "rebooted" again and created an eighth universe. This universe had multiple campaigns and player groups, but I used a lot more materials and started making original adventures again. This one universe ended up lasting me 20 years through multiple player groups and campaigns. This year on my 30th anniversary playing the game, I've started my ninth campaign universe to again reuse adventures, but this time it is for a new generation starting with my son who had only done a little roleplaying before this. This is my final campaign universe because I don't want to reboot anymore. I don't want a multiverse. In my mind, my multiverse no longer exists as distinct universes. My prior eight universes were all merged into this single new universe (in some cosmic event like DC's Crisis on Infinite Earths). Since the PT, I've found that I rather enjoy managing continuity and avoiding contradictions. I'm looking forward to the challenge of making everything fit together, and retiring adventures and campaigns permanently as I go. For this last universe, my goal is to use at least some aspects of every single product WEG published for the RPG (even the bad ones) so my collection is more practical. Adding adapted material from other games and my own stuff to that, I should not run out stuff for this campaign universe. Even though I've had a campaign multiverse, I admire GMs who don't.